Why does food taste so good when cooked over a fire? The food being cooked will likely contain ash, char, and sand (if the fire is on the beach), yet this somehow enhances the flavour. We had lobster twice while home on vacation. The first feast was cooked over a fire on a beach at Campobello Island; the second was cooked over a burner at the LeBlanc home. For both events, the lobster was steamed in salt water from the sea, and the cooking times would not have varied. 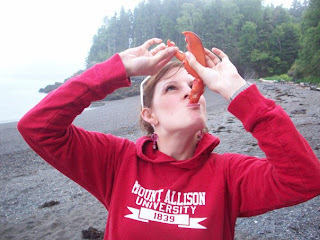 Yet those who had lobster on both occasions commented on how good the Campobello lobster was. Was that batch of lobster of better quality, or was it the raging flames that made all the difference? 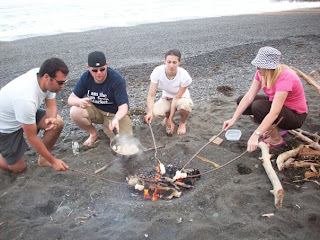 Lobster was not the only thing we cooked over a beach fire. We also feasted on scallops (cooked on a stick & in a pan), smores, hot dogs, and a whole pig. Yes, we tried our best at roasting a whole pig on a spit while in Cape Breton. It was a fun-filled, three-day event, led by one of our family chefs, Shaun, who when armed with a sharp boning knife can tackle any animal. On day one, the pig was purchased, deboned, and shaped for roasting. On day two, a roasting apparatus was constructed using various objects from my father-in-law’s pack-rat’s dream of a garage. That day, the pig was also placed in brine for seasoning. On day three, game day, Team Swine started early by prepping a fire on the beach. The pig made its appearance several hours later when the coals were nice and hot. What came next was not as easy. Credit definitely has to go out to all the guys who were constantly improvising to come up with solutions to the challenges that that pig kept throwing at us. Such challenges included a pig that did not spin along with the rod, a fire that was too hot, then too cool, then while reheating the fire the pig caught on fire, and so on. But it was certainly not all work without play. Our large group enjoyed horseshoes, live entertainment, swimming, snacking, and making a pig-shaped sand castle. But, after nine hours and a pig that was still only at 130°F, the rising tides forced us off the beach. The pig was finished at home in the oven and on the BBQ. Everyone patiently stuck around, and the finished product was well worth the wait. Shaun, I can’t wait for the next South Pondville Beach Pig Roast!